1) A combined drought indicator that links rainfall, surface air temperature, the vegetation status, surface and profile soil moisture. All datasets are either satellite-derived or modeled, resulting in a higher spatial consistency than than in-situ (local) measurements. 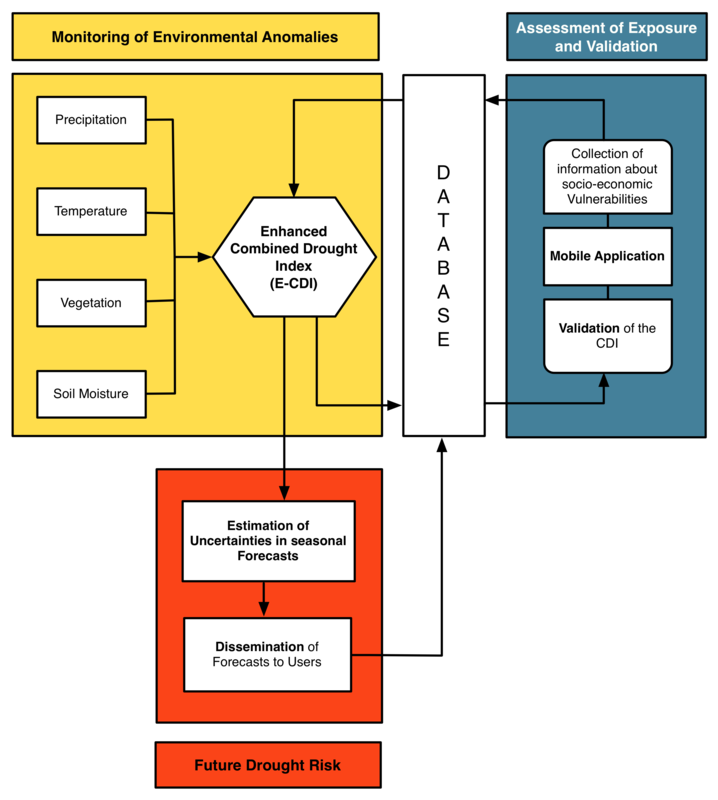 The first product will be an Enhanced Combined Drought Index (E-CDI) that is updated every 8 days at a spatial resolution of 25 kilometers – sufficient to monitor the extent and severity of large-scale droughts. The European Centre for Medium-Range Weather Forecasts (ECMWF) provides uncalibrated seasonal forecasts up to lead times of several months. Within SATIDA these predictions are calibrated for three regions of interest. Forecasts up to lead times of three months will be tested. A retrospective analysis of the calibrated forecasts in relation to reference data (e. .g regional information about drought impacts) will help to quantify their reliability. Drought does not necessarily have an impact on food security. In return, food security can be triggered by other causes than drought. Consequently, we develop a mobile application for Android smart phones or tablets to facilitate access to monitoring and forecasting data. In addition, the app will be used to complement in-depth household assessments via more frequent evaluations of the food basket, the availability of resources (e. g. drought-resistant seeds), movement of refugees, forced sale of cattle, etc.). A smart database structure is required to integrate information on environmental anomalies and socio-economic conditions. The database is developed in Python and designed to generate time series or images on the fly, minimizing the disk space. In order to optimize the “DATABASE” in the previous figure a new toolbox was developed. POETS (Python Open Earth Observation Tools) is an open source approach to automatically fetch, download, prepare, analyze and visualize datasets, facilitating easier use of complex satellite-derived data from different sources for a wide range of users.